Thought I'd do an "inside look" before I ate them all. All! 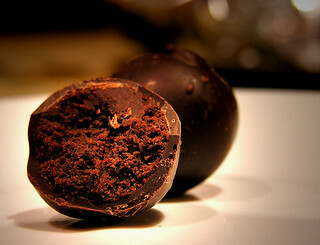 The recipe is modified from "Black Tea Bittersweet Chocolate Truffles" in Truffles by Dede Wilson. I used three tablespoons loose Earl Grey tea leaves instead of two, and I would also recommend steeping the leaves for about 10 minutes instead of six. The Earl Grey flavour wasn't as strong as I would have liked.